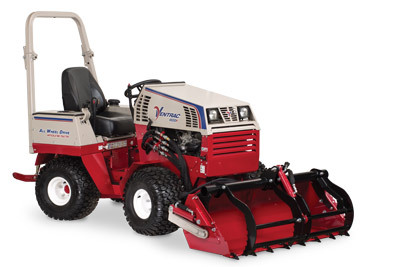 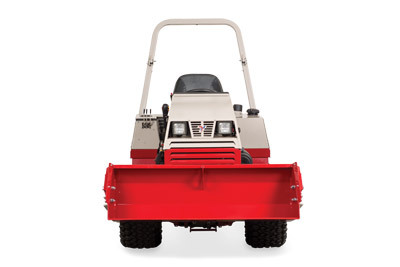 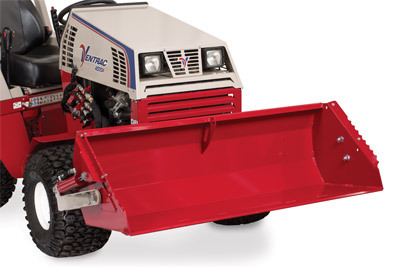 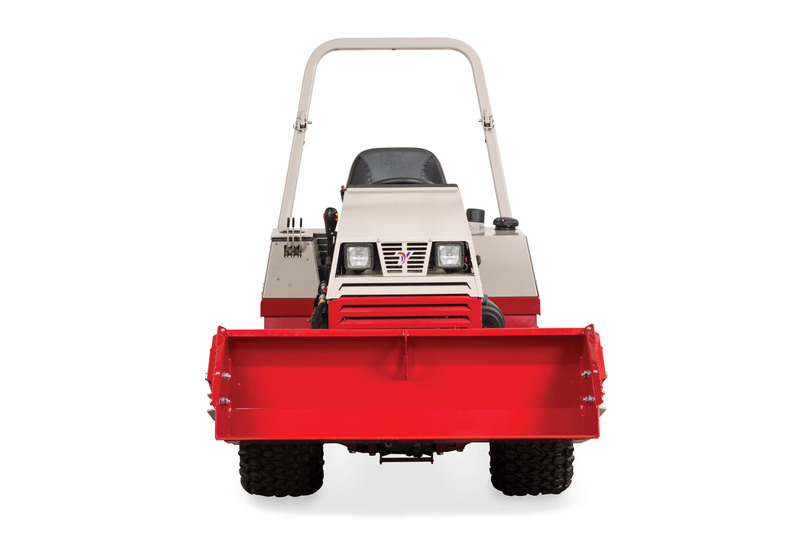 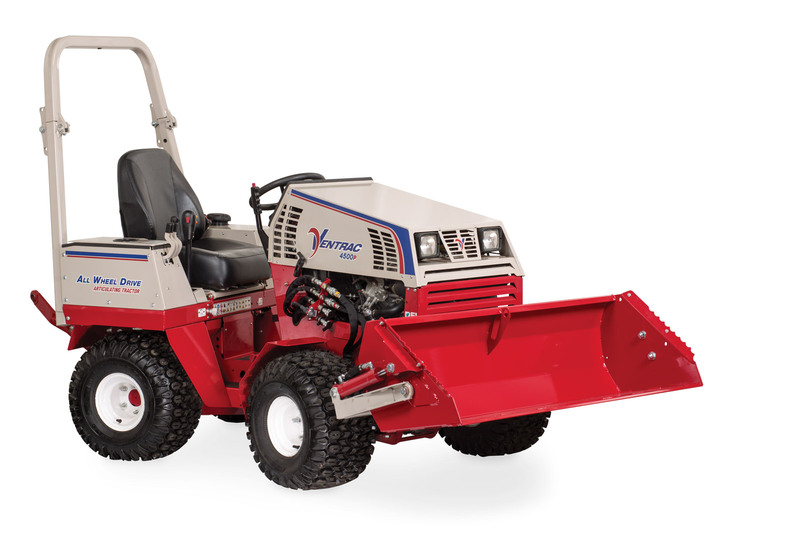 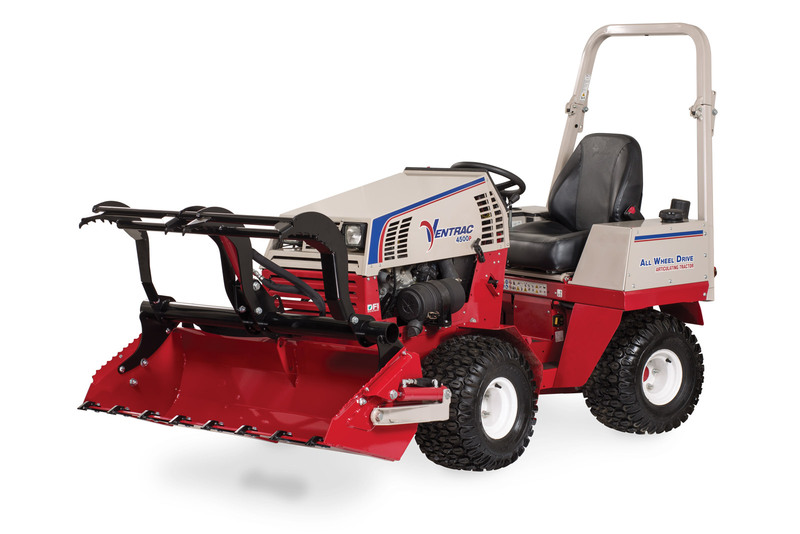 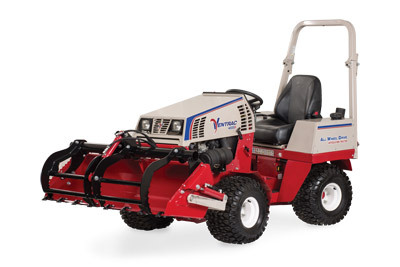 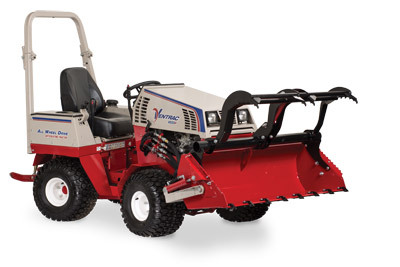 Ventrac Power Buckets are a must for any Ventrac owner. 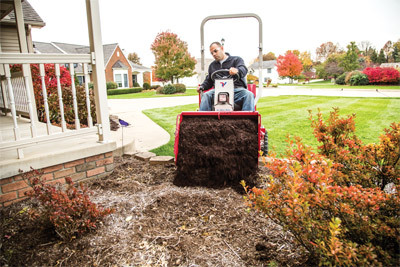 The scoops are great for transporting material such as soil, sand, gravel, mulch, debris, snow, and much more. 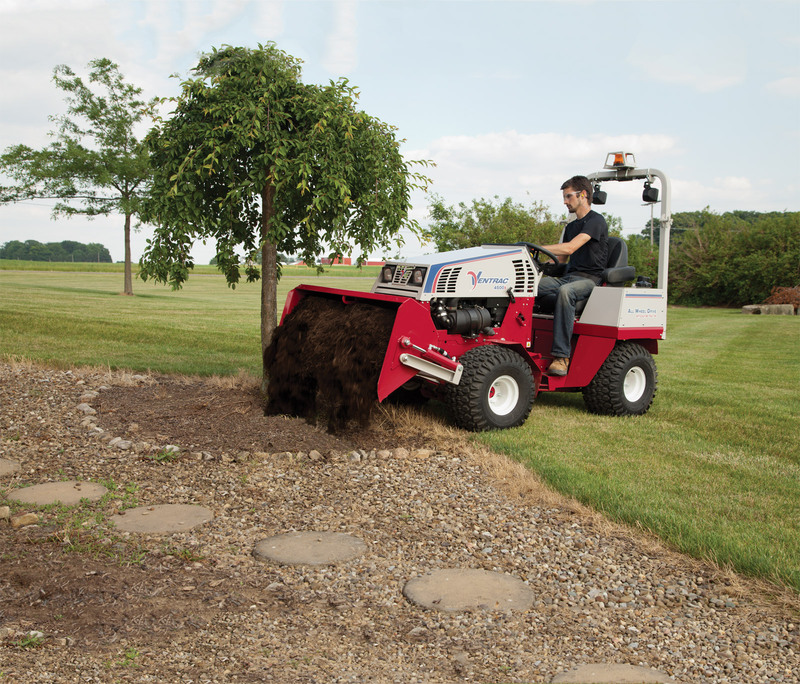 Used for landscaping, excavation, back-filling, leveling, digging and grading, the Power Buckets are an indispensable attachment from construction sites to your own backyard, allowing you to say goodbye to your old wheelbarrow. 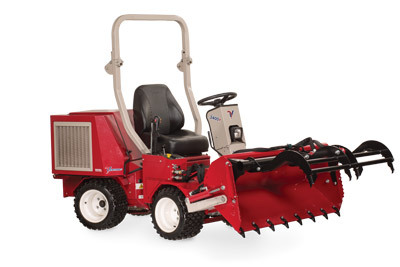 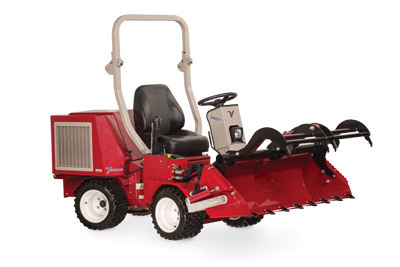 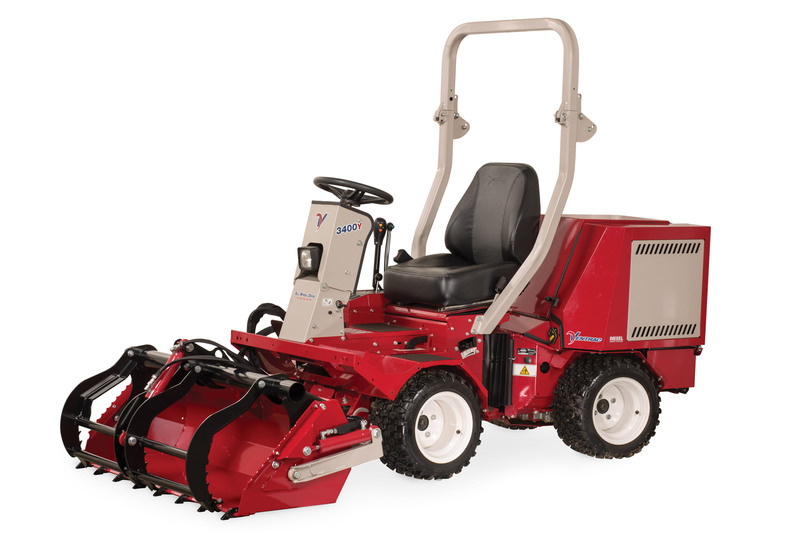 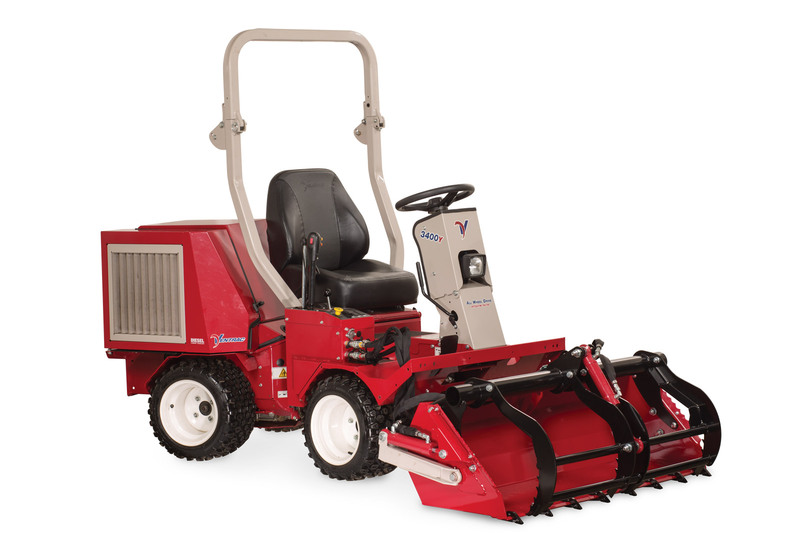 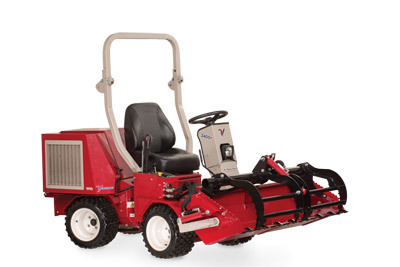 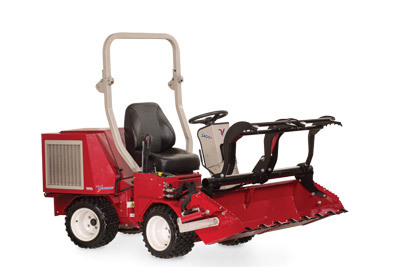 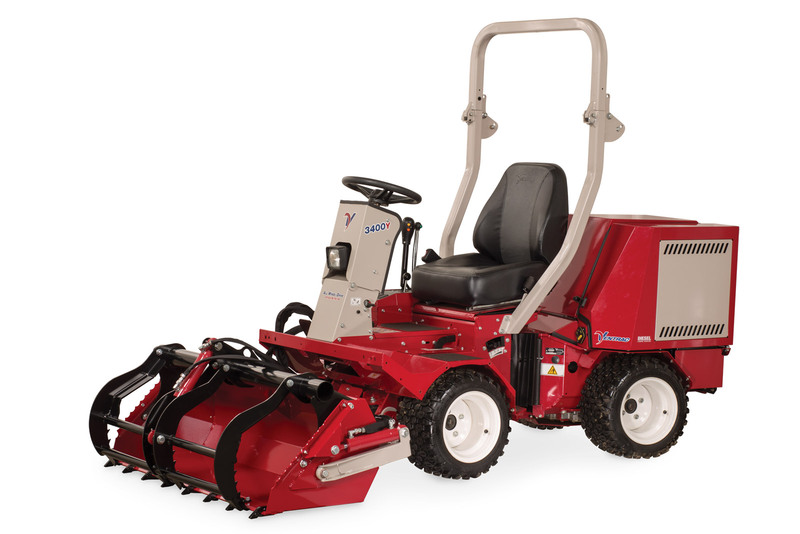 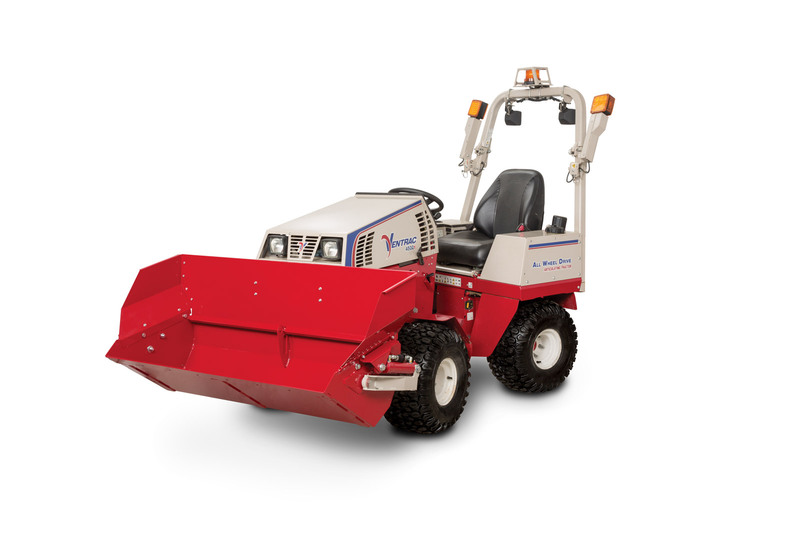 Ventrac Power Buckets are hydraulically controlled from the driver's seat, allowing for smooth, effortless operation. 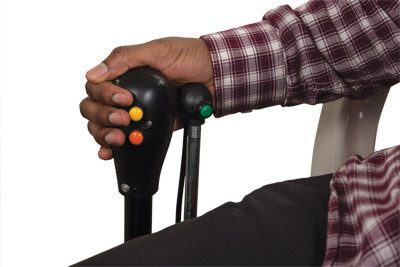 The Power Bucket is designed to sit upright after detachment, with the lift arms in the proper position for direct reconnect when the bucket is used again. The Power Bucket attaches with the Ventrac Mount System, allowing for attachment changes in a snap. With the optional Grapple, your Power Bucket transforms into the ultimate tool, allowing you to securely transport debris, brush, branches, and logs with ease. 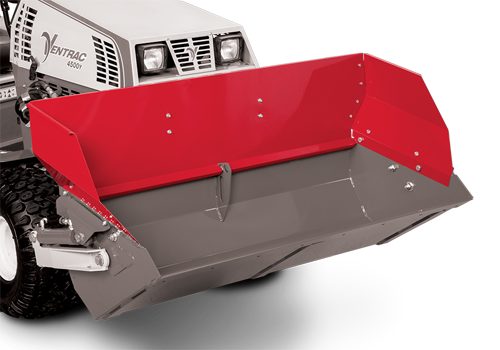 Increase the capability of your Power Bucket capacity by a full 75%, from 6 cubic feet to 10.5 cubic feet. 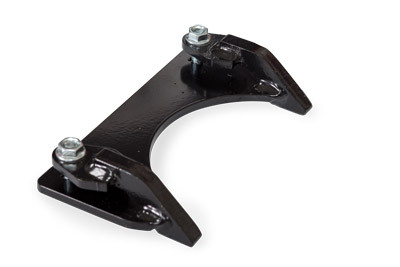 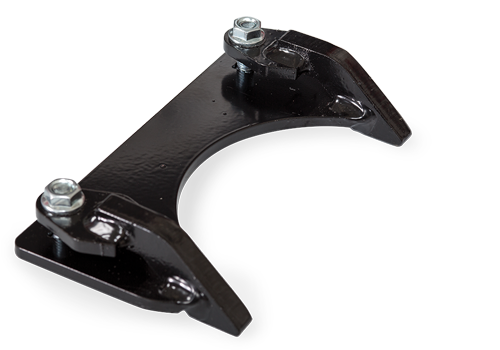 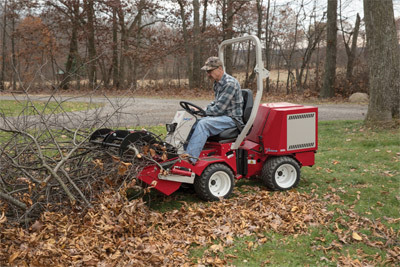 They are perfect for mulch, loose debris, and other light weight applications. 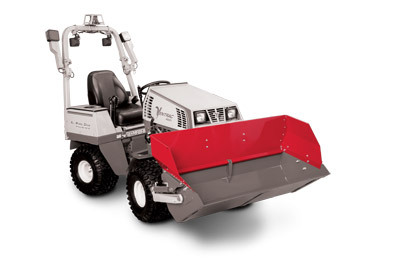 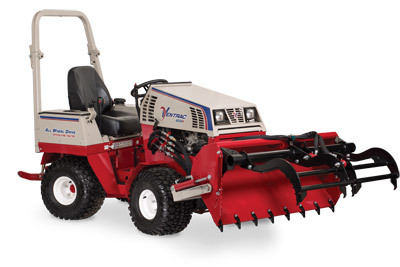 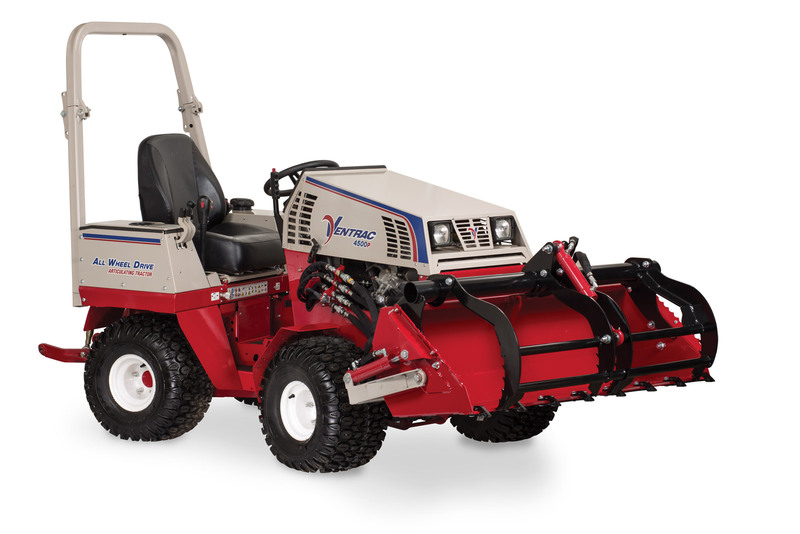 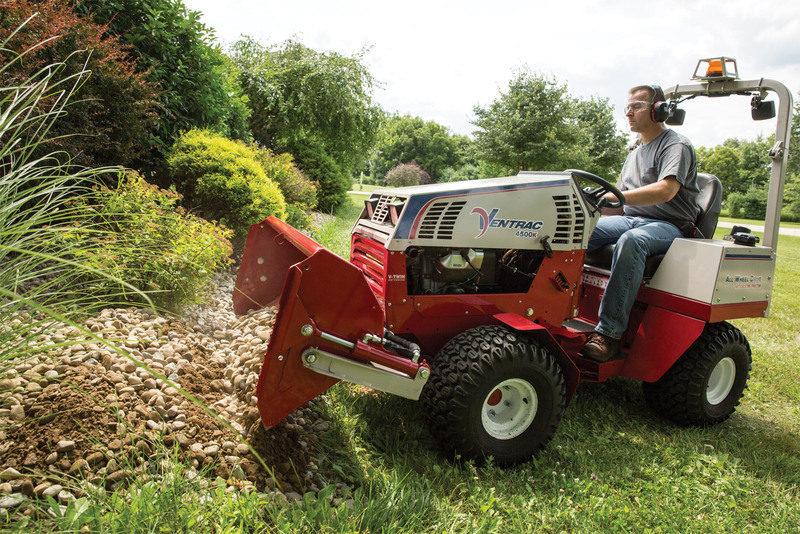 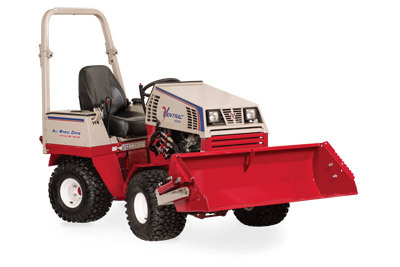 Move stone, brush, mulch, and more with the Ventrac Power Bucket. See the new Power Bucket in Action including the new optional grapple accessory. Introduction to new features on the HE302 & HE482 Power Buckets. 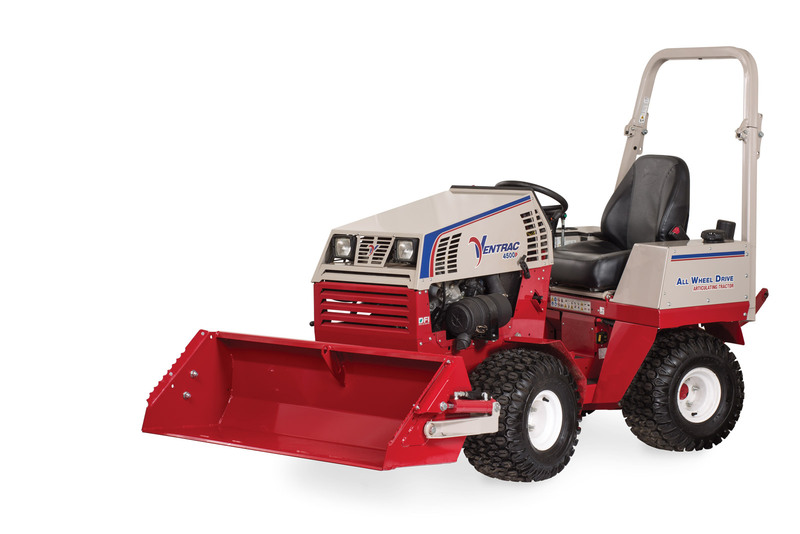 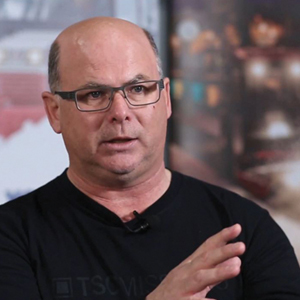 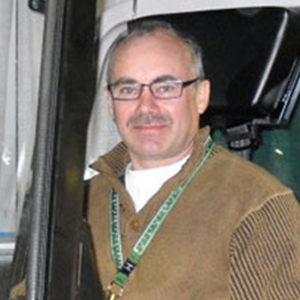 When Sanford Yoder first saw a Ventrac Power Bucket, he was quick to dismiss it. 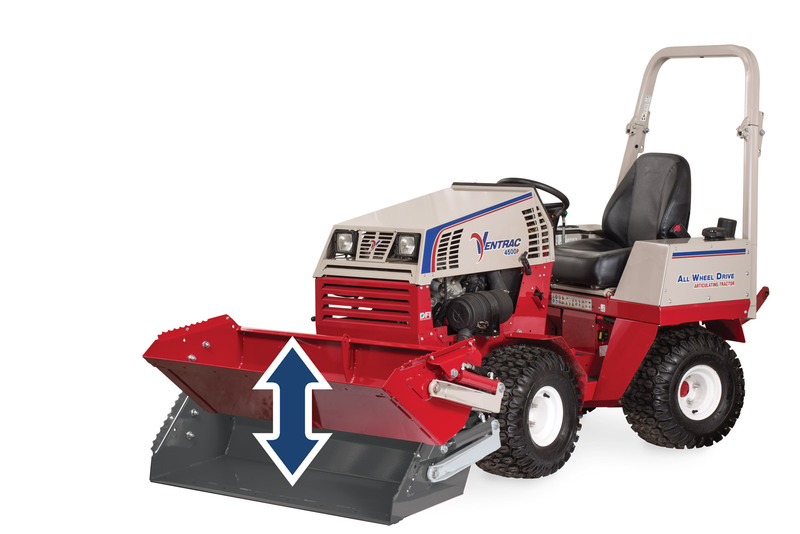 However, after using a Power Bucket, Yoder became a believer. 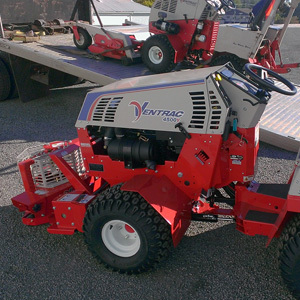 When Camp Luz needed some volunteers to help with their new garage installation, Ventrac stepped up in a big way. 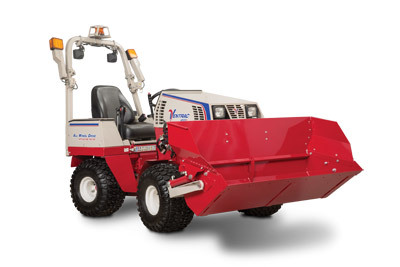 The Power Bucket is the perfect tool for transporting gravel, stone, and mulch material for landscaping as well as excavating, back-filling, leveling, digging, and grading. 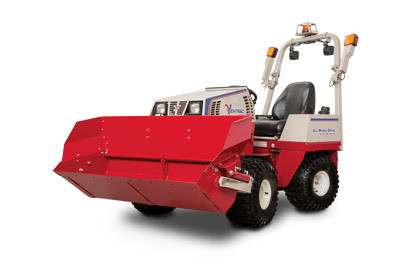 The bucket is hydraulically controlled so your work time is cut down with minimal effort from the driver's seat. 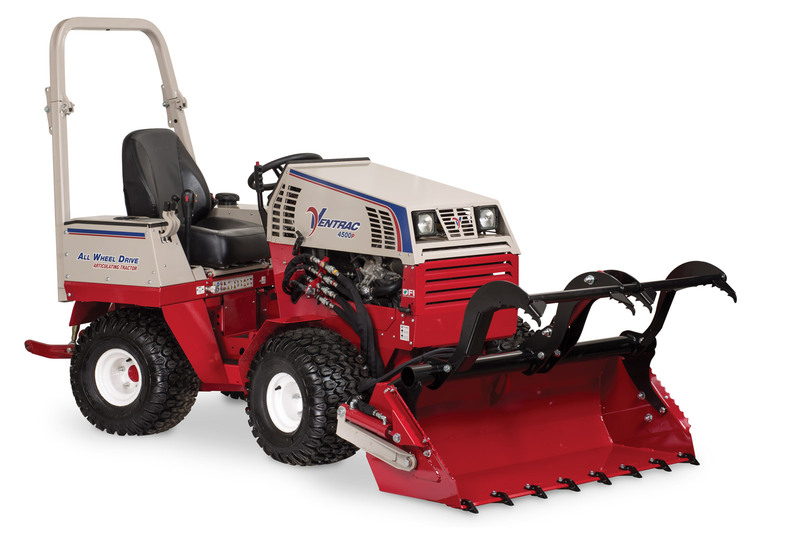 In this video we compare how a traditional sub compact tractor with loader and a Ventrac tractor differ at turf disturbance. The articulated style of tractor is by far the best way to maneuver a all wheel drive tractor across delicate turf surfaces and do the least amount of damage. 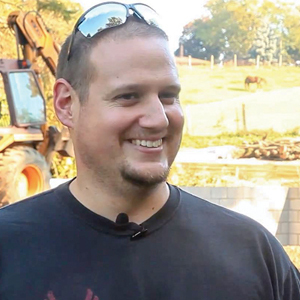 Aaron takes us behind the scenes to show how a Ventrac 4500 can be used to help out in building a raised garden bed with rocks. 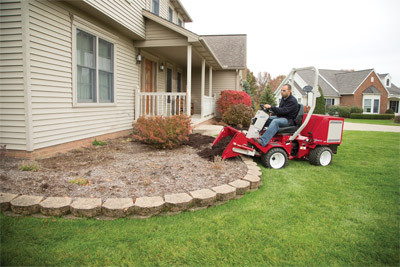 The homeowner is adding a second raised bed around part of the perimeter of his current garden. 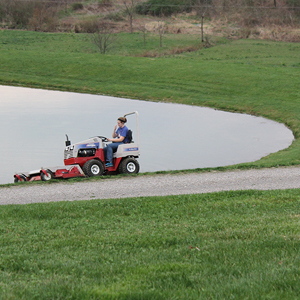 He is doing this for more delicate vegetable growing like lettuce, peppers and plants started from seed. 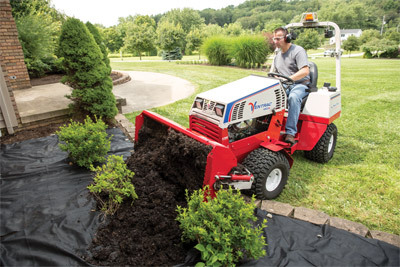 These vegetables need loose soil to germinate and grow young roots. 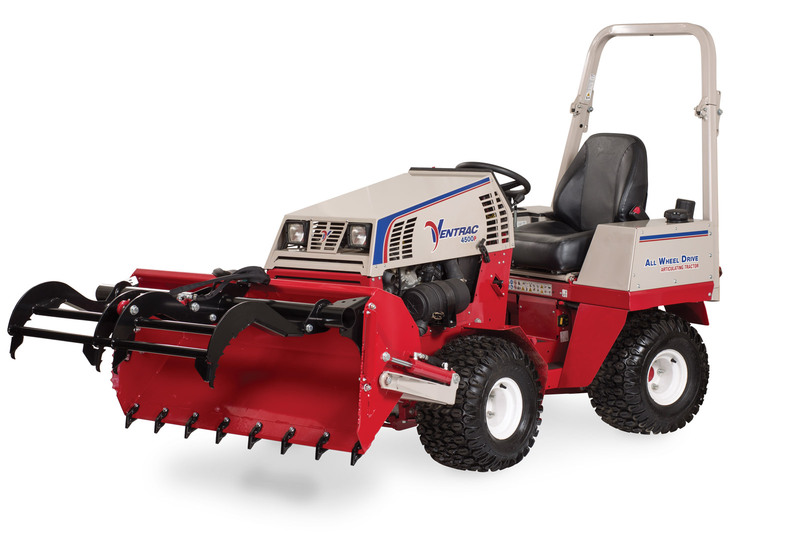 Enlarge Picture / Press Link · Ventrac 4500 with Power Bucket Extensions - Get your mulching and other yard work done quicker with the Ventrac Power Bucket and Extension. 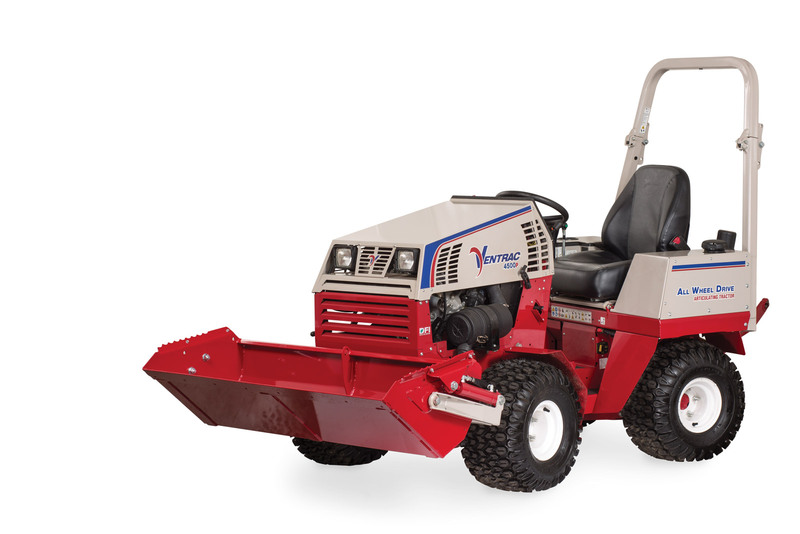 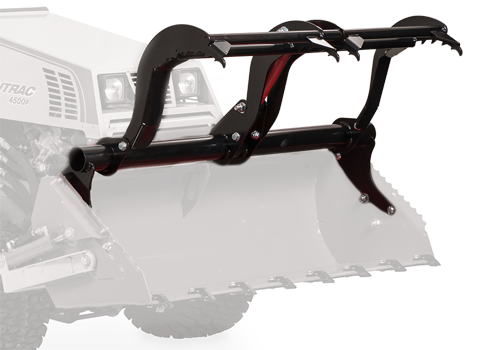 Enlarge Picture / Press Link · Power Bucket with optional Grapple - The Ventrac 4500 Power Bucket is even more versatile with the optional grapple accessory. 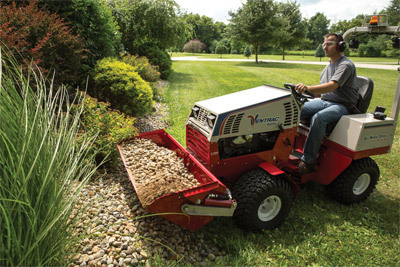 Enlarge Picture / Press Link · Ventrac 4500 using the Power Bucket - Home owners find more uses for their Power Bucket around their property than they initially believe. 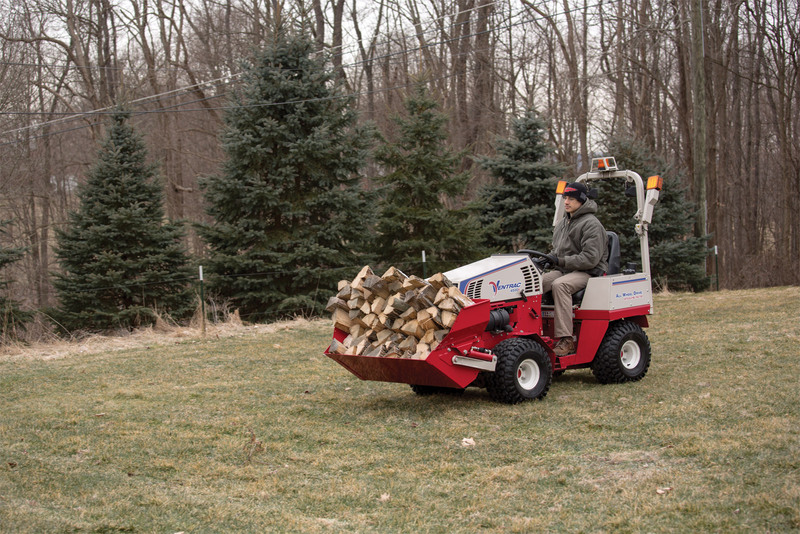 Enlarge Picture / Press Link · Ventrac 4500 with the Power Bucket - Better than a wheel barrow the Power Bucket delivers mulch where you want it saving you time and making your work load lighter. 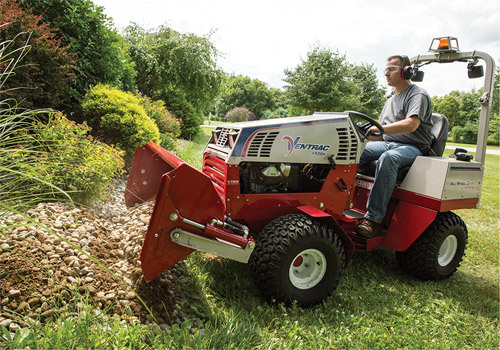 Enlarge Picture / Press Link · Ventrac 3400 using the Power Bucket - Using the optional grapple the Power Bucket becomes even more versatile. Enlarge Picture / Press Link · Ventrac 4500Y diesel with Slip Scoop bucket - The 4500 with Power Bucket lets you put mulch right where you want it simply and easily. Enlarge Picture / Press Link · Ventrac 4500Y articulating tractor with Power Bucket - The power bucket offers you a versatile solution for moving dirt, mulch, gravel, sand, and more. Enlarge Picture / Press Link · The Power Bucket on a Ventrac 4500 - The Power Bucket's large capacity means fewer trips and time saved. 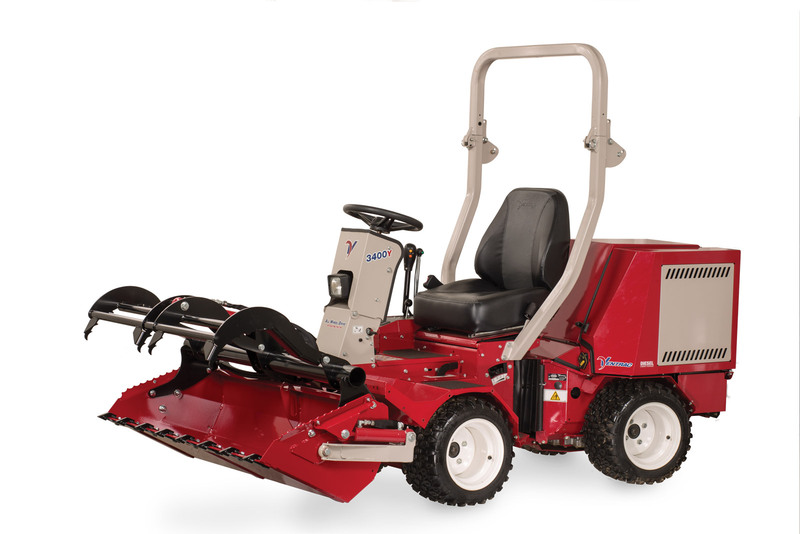 Enlarge Picture / Press Link · Power Bucket on the Ventrac 4500 - The Power Bucket allows for precise placement of materials to prevent damage to shrubs and flowers while saving you from the heavy lifting. 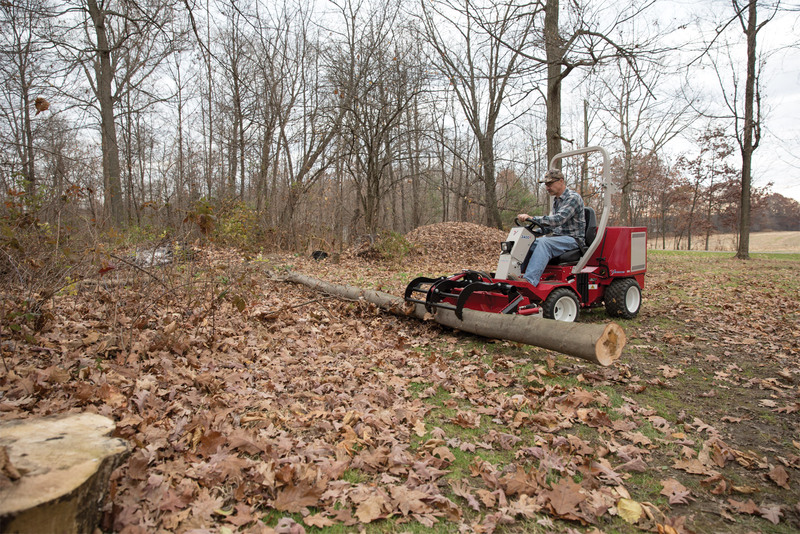 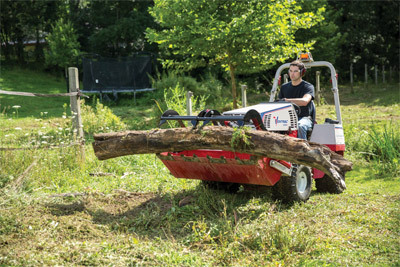 Enlarge Picture / Press Link · Ventrac 4500 using Power Bucket with Grapple - The optional Grapple for the Power Bucket even makes moving felled trees easier. 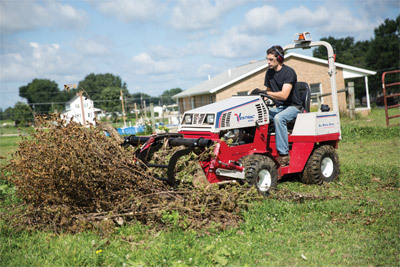 Enlarge Picture / Press Link · Ventrac 4500 and Power Bucket - Move piles of brush and tree branches in one trip with the Power Bucket and optional Grapple. 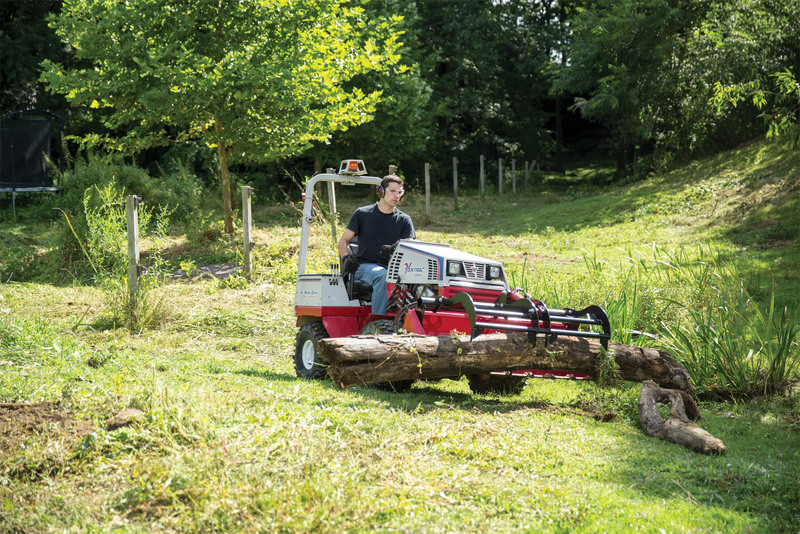 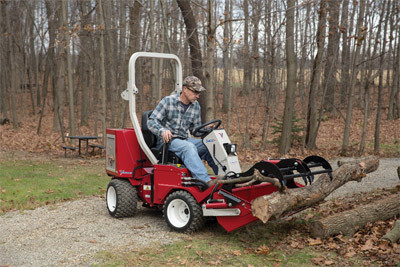 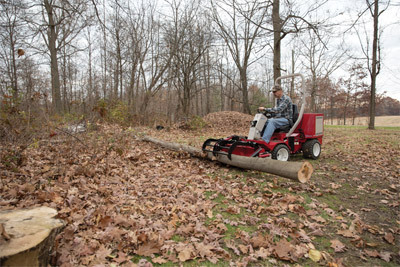 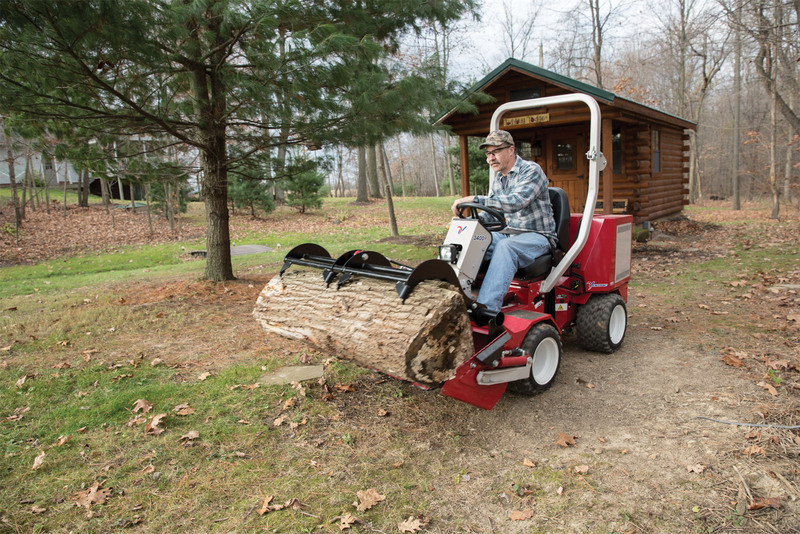 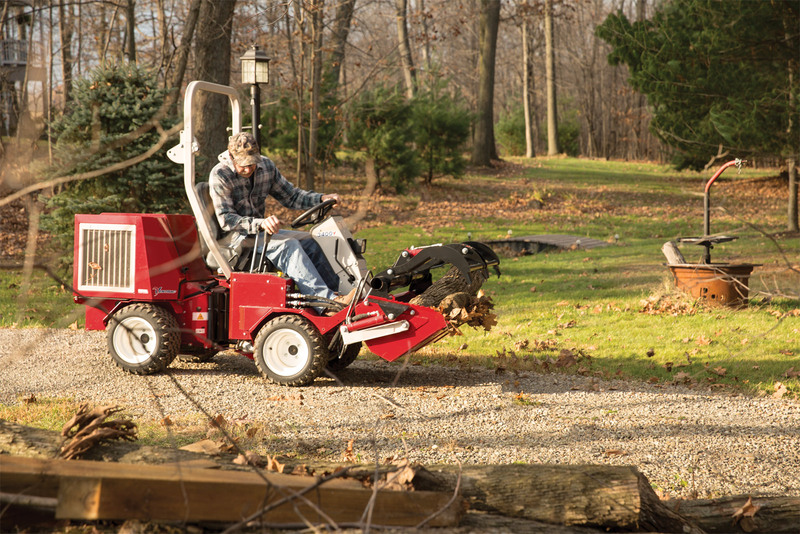 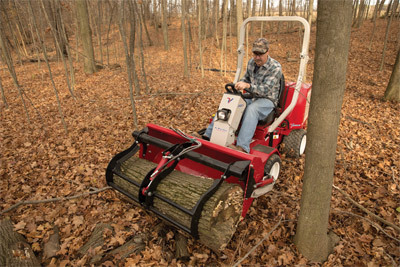 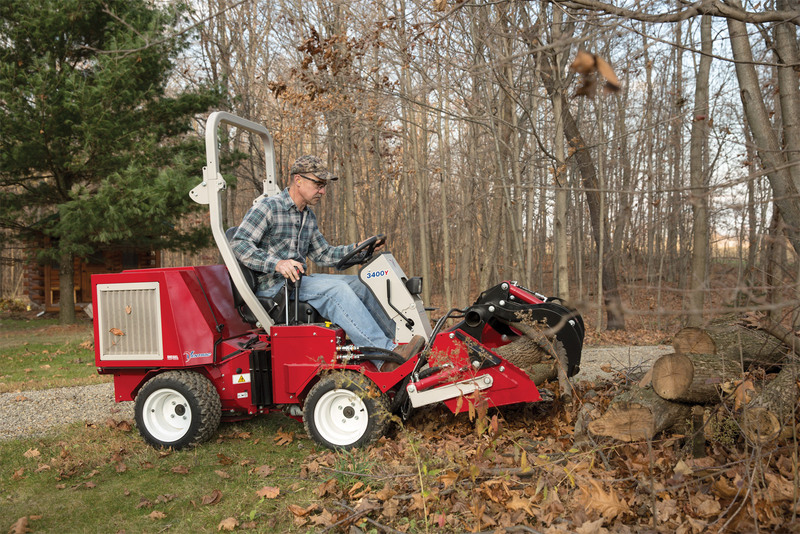 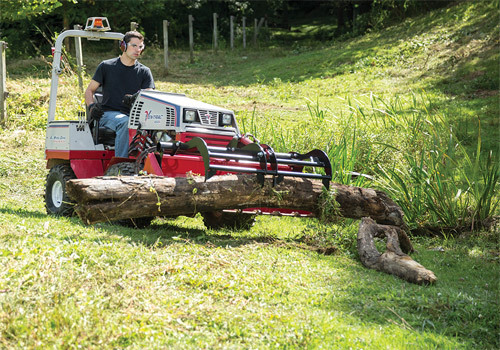 Enlarge Picture / Press Link · Ventrac 3400 with Power Bucket - Moving around piles of firewood is easier with the Power Bucket. 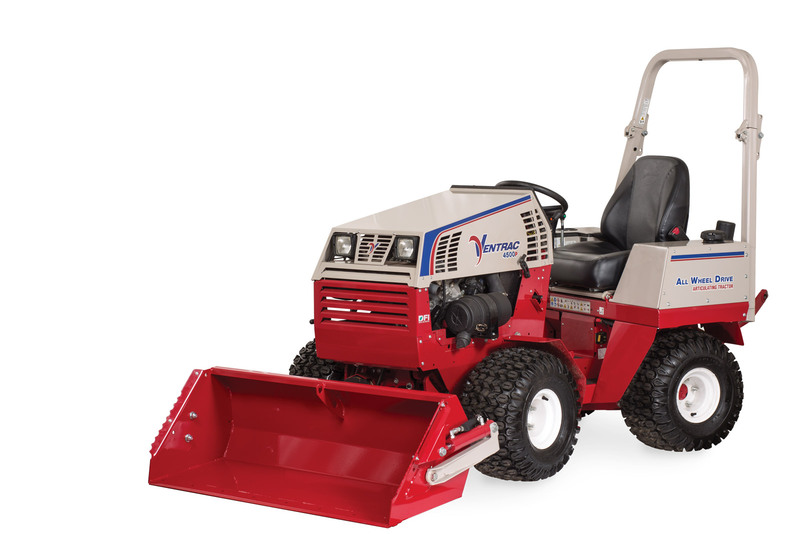 Enlarge Picture / Press Link · Ventrac 3400 using Power Bucket - The Power Bucket on your Ventrac is the best wheel barrow you'll ever have. 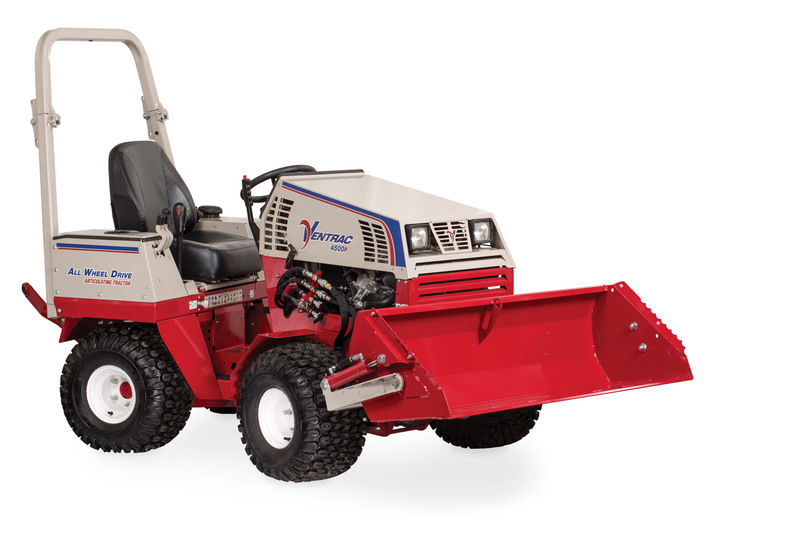 Enlarge Picture / Press Link · Ventrac 3400 using Power Bucket and Grapple - The optional Grapple for the Power Bucket tackles large and awkward loads safer and simpler. 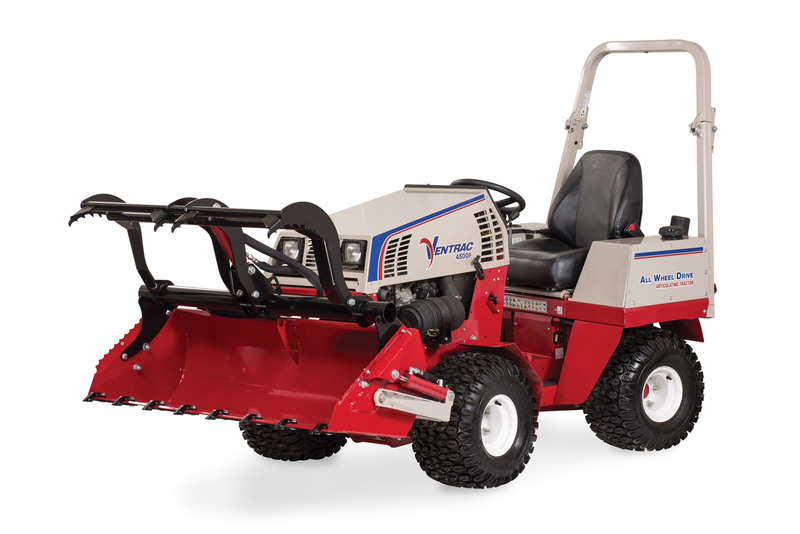 Enlarge Picture / Press Link · Ventrac 3400 with optional Grapple on Power Bucket - No more need struggling with chains or ropes and dragging large tree limbs and the like when you have the Power Bucket and Grapple to more easily handle those loads. Enlarge Picture / Press Link · Power Bucket with optional Grapple on a Ventrac - Brush, compost, leaves, and waste materials can all be handled using the Power Bucket and Grapple for the Ventrac. Enlarge Picture / Press Link · The Power Bucket with Grapple on a Ventrac 3400 - Objects like a fallen tree that would require two people and a lot of chain to move are more safely and easily handled with the Ventrac using a Power Bucket and optional Grapple. Enlarge Picture / Press Link · The Ventrac 4500 using the Power Bucket with optional Grapple - Maintaining your yard with the Power Bucket and Grapple on the Ventrac saves time and work moving piles of brush, branches, cuttings, leaves, and such easier than using a wheel barrow. 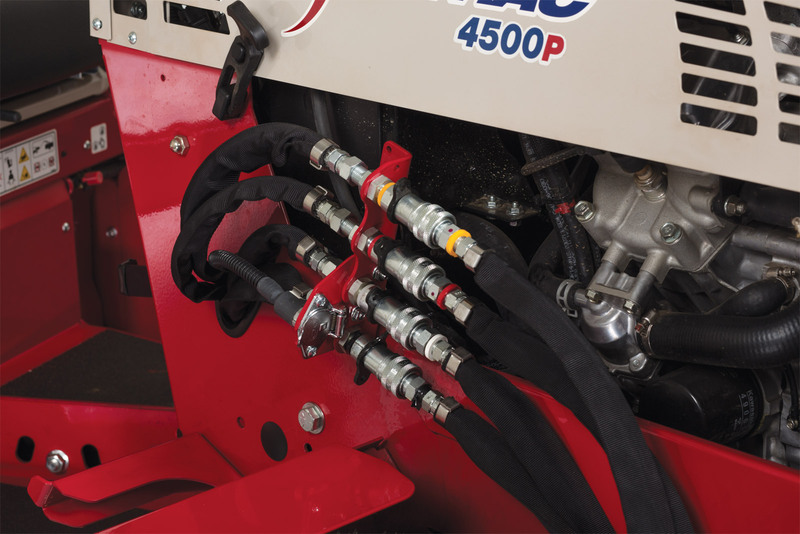 Enlarge Picture / Press Link · Closeup of Front Hydraulic Aux Kit Handle - Optional kit that adds two more hydraulic ports to allow for more functions for certain attachments on the front of the Ventrac. 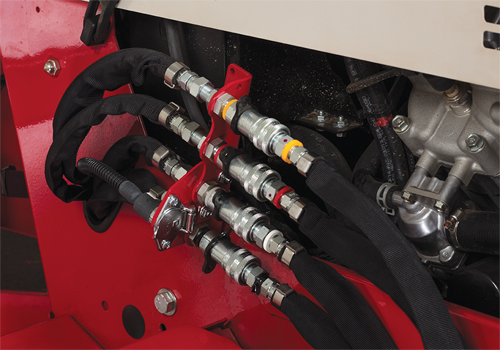 Enlarge Picture / Press Link · Closeup of Front Hydraulic Aux Kit Hose Assembly - Optional kit that adds two more hydraulic ports to allow for more functions for certain attachments on the front of the Ventrac. 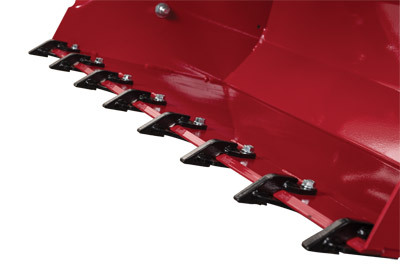 Enlarge Picture / Press Link · Closeup of teeth for Power Bucket - Shown is a set of two teeth on a single mounting bracket that mounts on the Power Bucket. 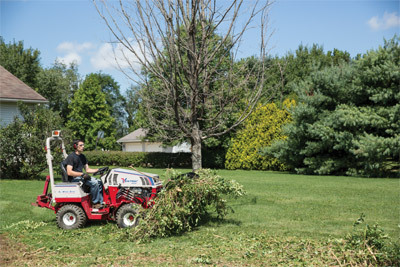 Three sets fit on the HE302 and four sets fit the HE482. Enlarge Picture / Press Link · Ventrac 4500 with Power Bucket dumped - Illustration shows the dump motion for the bucket. 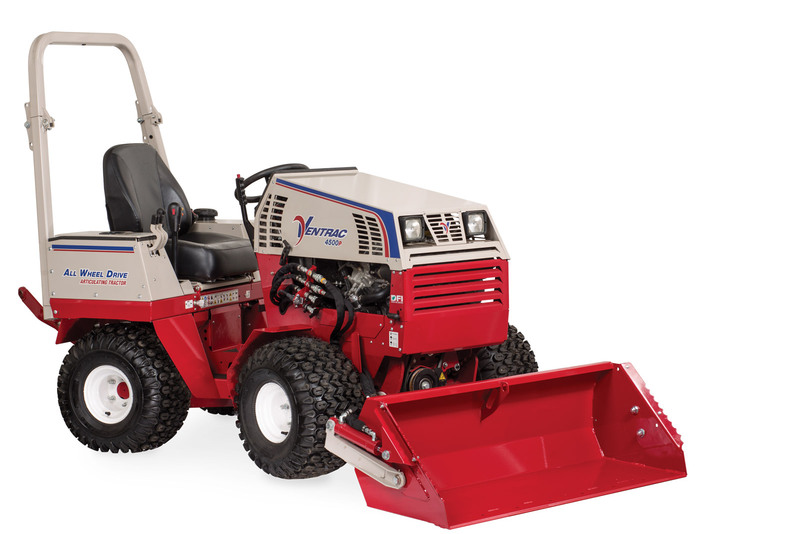 Enlarge Picture / Press Link · Ventrac 4500 with Power Bucket tilt back - Illustration shows the range of upward tilt on bucket. 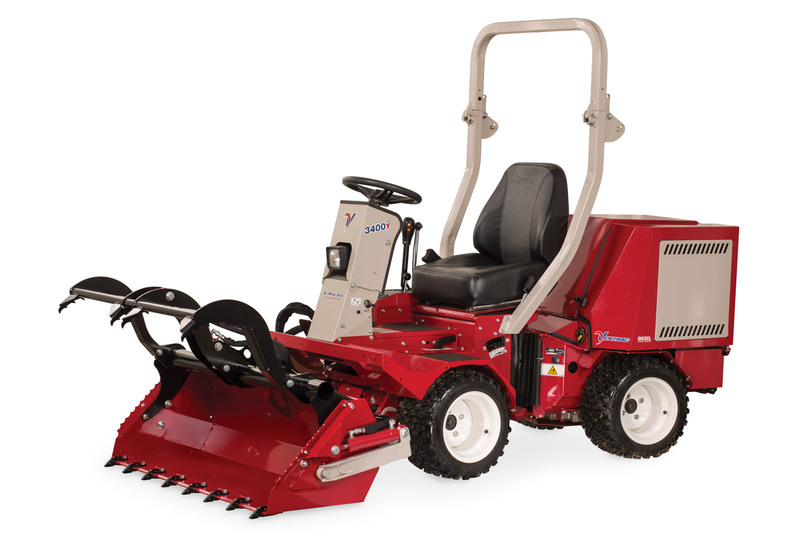 Enlarge Picture / Press Link · Ventrac 4500 with Power Bucket at rest - Illustration shows the bucket at the lowest position. 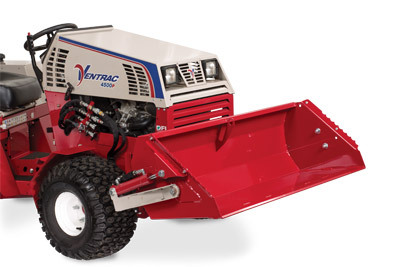 Enlarge Picture / Press Link · Ventrac 4500 with Power Bucket lifted - Illustration shows bucket at max lifted height. 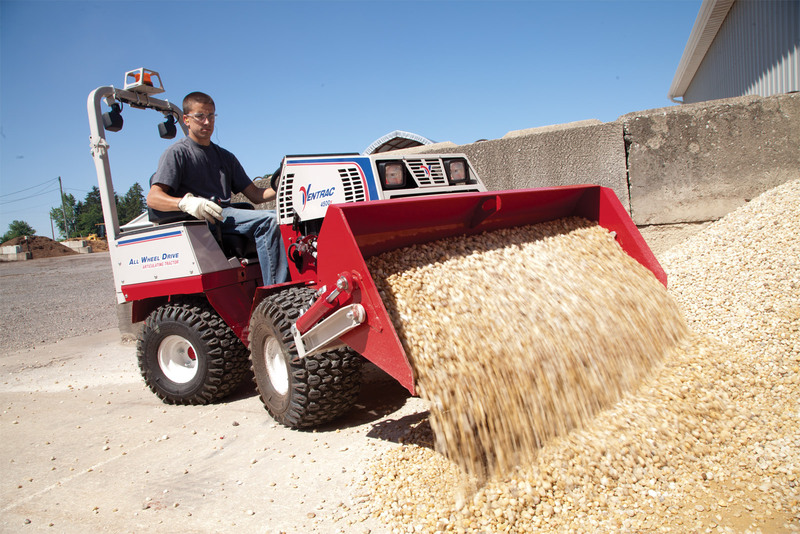 Enlarge Picture / Press Link · Ventrac 4500 with Power Bucket dumped right side - Illustration shows the dump motion for the bucket. 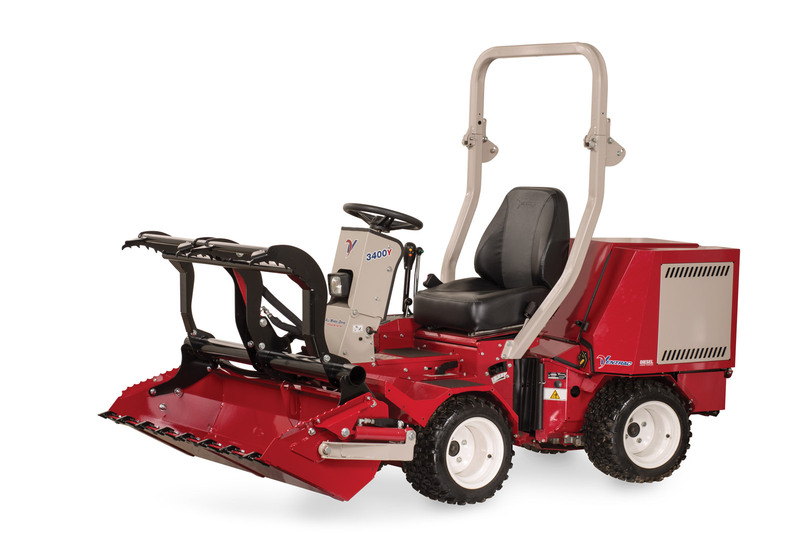 Enlarge Picture / Press Link · Ventrac 4500 with Power Bucket at rest right side - Illustration shows the bucket at the lowest position. 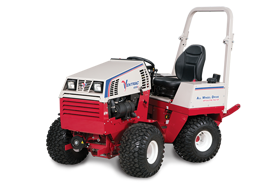 Enlarge Picture / Press Link · Ventrac 4500 with Power Bucket lifted right side - Illustration shows bucket at max lifted height. 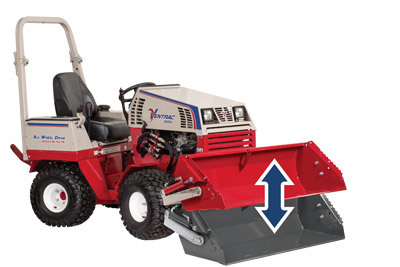 Enlarge Picture / Press Link · Ventrac 4500 with Power Bucket - Illustration shows the range of upward tilt on bucket. 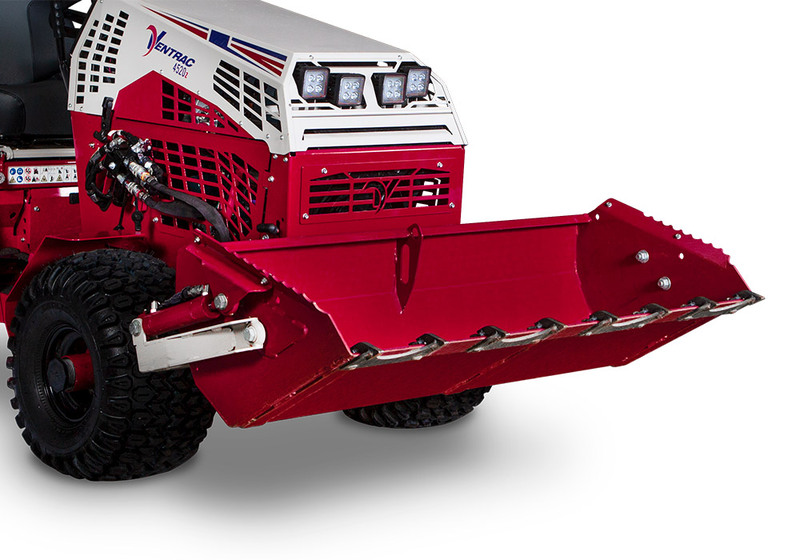 Enlarge Picture / Press Link · Ventrac 4500 with Power Bucket dumped grapple open - Shown with optional Grapple and Cutting Teeth. Enlarge Picture / Press Link · Ventrac 3400 with Power Bucket and Grapple closed and lowered - Shown with optional Grapple and Cutting Teeth. Enlarge Picture / Press Link · Ventrac 3400 with Power Bucket and Grapple lowered fully extended - Shown with optional Grapple and Cutting Teeth. Enlarge Picture / Press Link · Ventrac 3400 with Power Bucket and Grapple lowered partially extended - Shown with optional Grapple and Cutting Teeth. 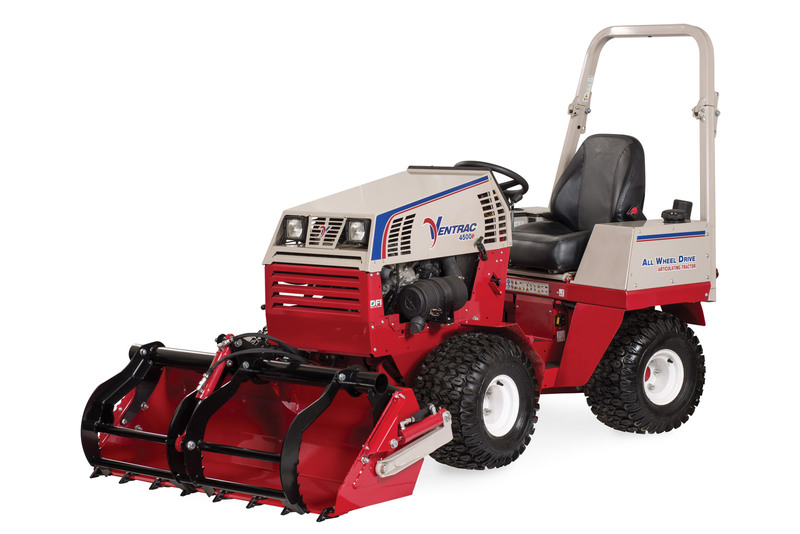 Enlarge Picture / Press Link · Ventrac 3400 with Power Bucket and Grapple left side view - Shown with optional Grapple and Cutting Teeth. 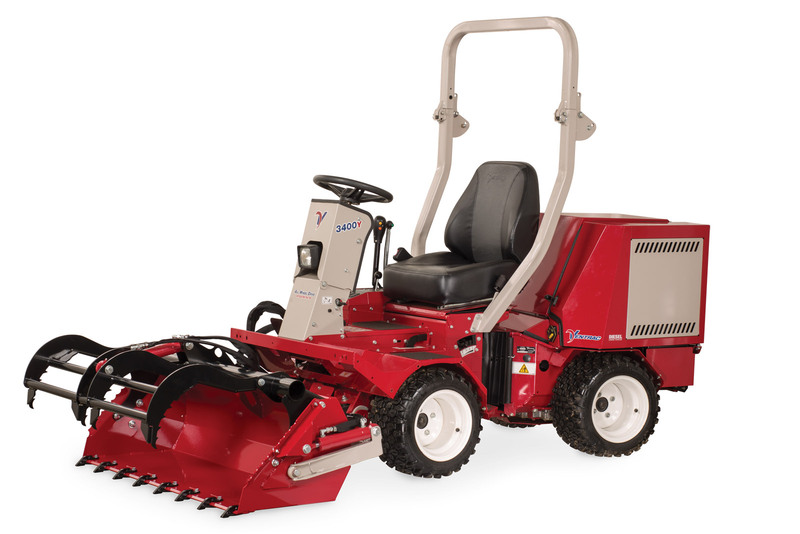 Enlarge Picture / Press Link · Ventrac 3400 with Power Bucket and Grapple raised fully extended - Shown with optional Grapple and Cutting Teeth. 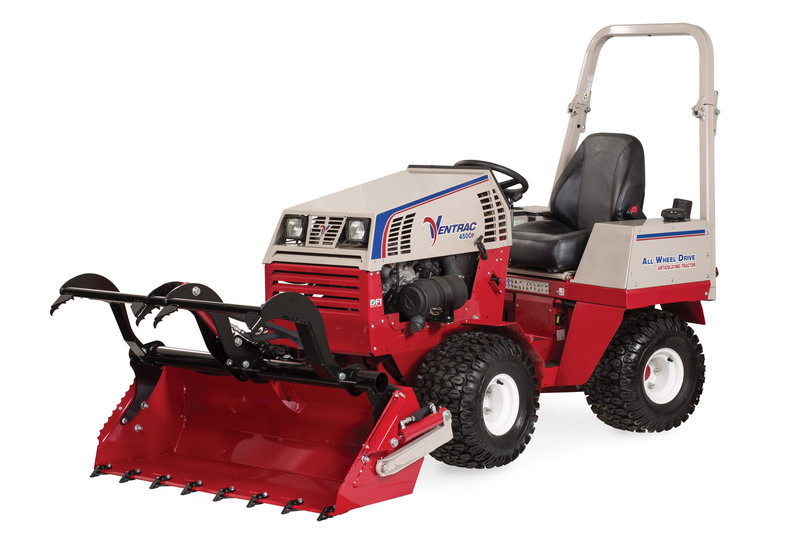 Enlarge Picture / Press Link · Ventrac 3400 with Power Bucket and Grapple lowered right side view - Shown with optional Grapple and Cutting Teeth. Enlarge Picture / Press Link · Ventrac 3400 with Power Bucket and Grapple extended right view - Shown with optional Grapple and Cutting Teeth. 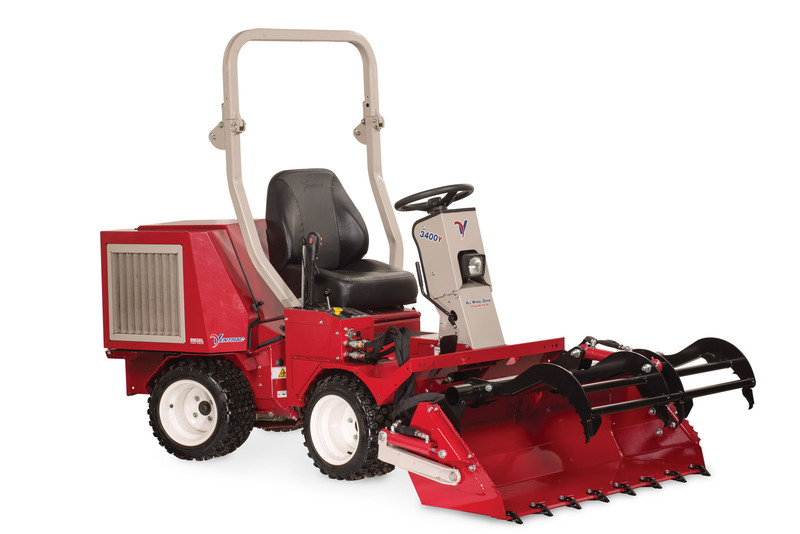 Enlarge Picture / Press Link · Ventrac 3400 with Power Bucket and Grapple dumped and extended - Shown with optional Grapple and Cutting Teeth. 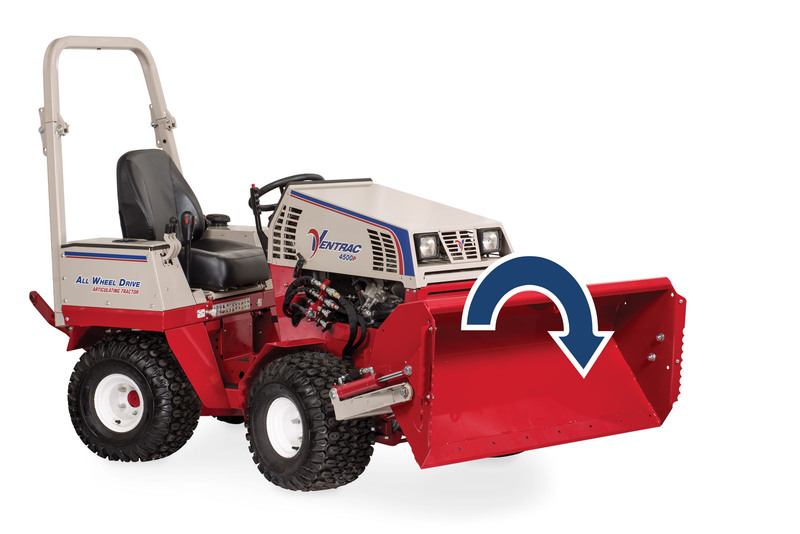 Enlarge Picture / Press Link · Power Bucket for Ventrac 4500 - The 48 inch Power Bucket shown with optional Extension can double your carrying capacity saving even more time getting more work done. Enlarge Picture / Press Link · Ventrac 4500 with Power Bucket Right Side - Shown with optional Extension for the Power Bucket. 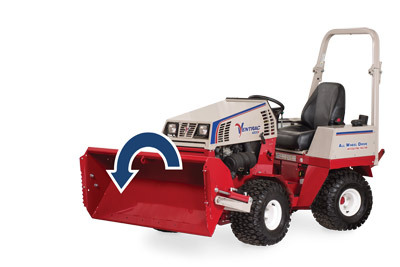 Enlarge Picture / Press Link · Optional Extension for the Power Bucket - Increase your productivity by adding on to your Power Bucket for the Ventrac 4500. Enlarge Picture / Press Link · Ventrac 4500 with Power Bucket Left Side - Shown with optional Extension for the Power Bucket. 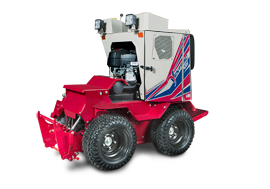 Enlarge Picture / Press Link · Ventrac 4500 with Power Bucket Profile - Shown with optional Extension for the Power Bucket. Enlarge Picture / Press Link · Driver's View of Power Bucket with Extension - Increased carrying capacity without much decreased visibility. 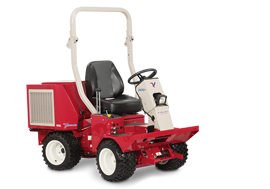 Enlarge Picture / Press Link · Ventrac 4500 with Power Bucket and optional Extension - Greatly increase your overall carrying capacity with the optional extension for the Power Bucket. 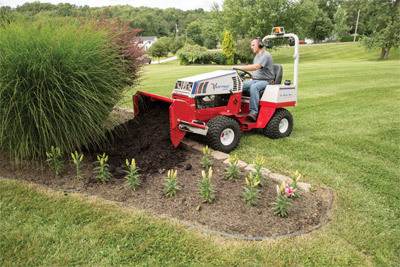 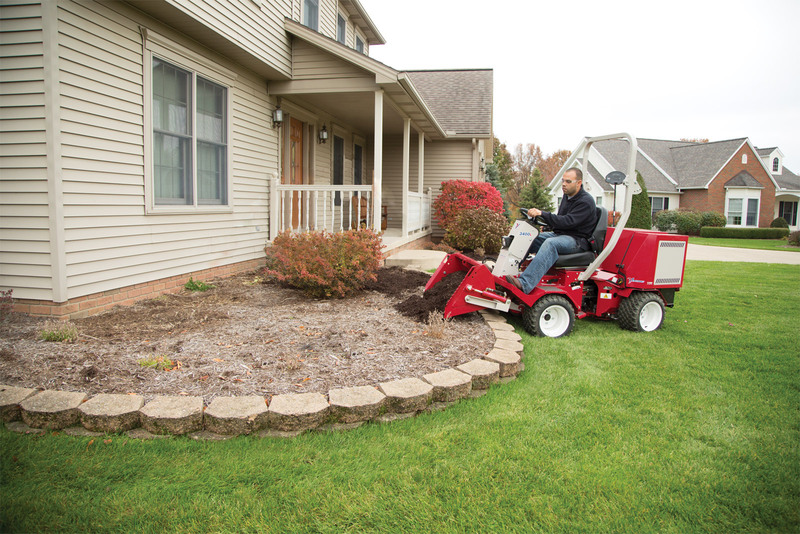 Enlarge Picture / Press Link · Ventrac 4500Z with Power Bucket Extension - Homeowners will find that using Ventrac to mulch the spring flowerbeds is so effective it can replace their wheelbarrow. 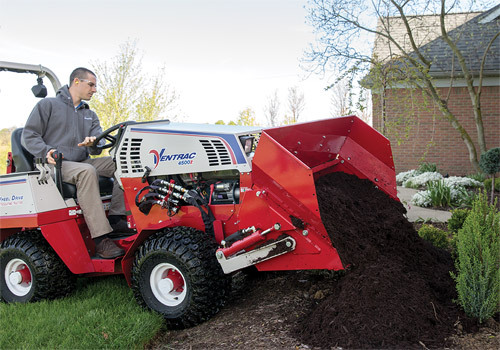 Enlarge Picture / Press Link · Ventrac 4500 with Power Bucket and Power Bucket Extension - Move twice as much mulch in one trip with the Bucket Extension for the Power Bucket and make fewer trips and save time. Enlarge Picture / Press Link · Ventrac 4500P and Power Bucket - Sand trap repair is one of many projects Ventrac makes easier for golf courses. 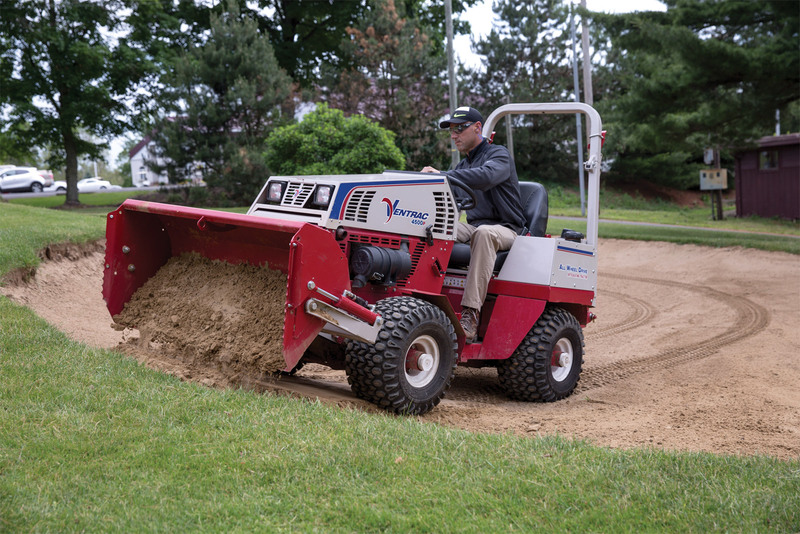 Enlarge Picture / Press Link · Ventrac 4500 and Power Bucket on Golf Course - Golf courses find the versatility of the Ventrac makes maintenance simpler. 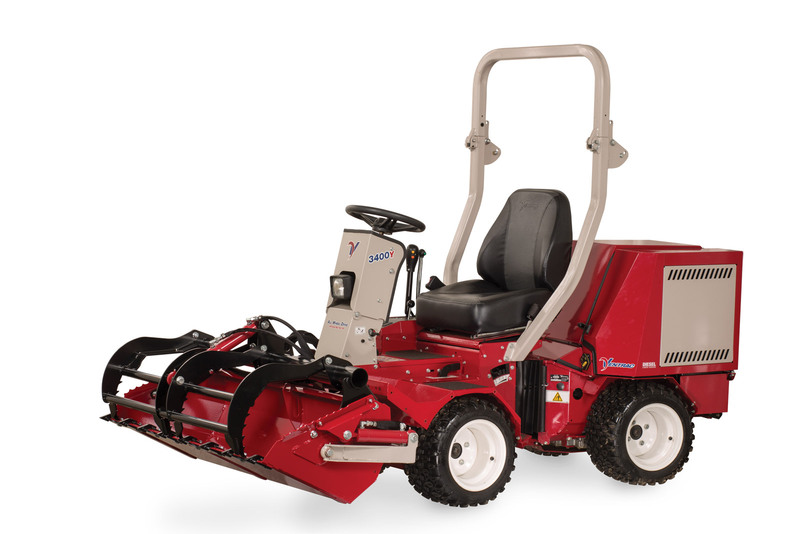 Enlarge Picture / Press Link · Ventrac 4500P Using Power Bucket on Golf Course - Even if you aren't maintaining a professional golf course the Ventrac is still an efficient and versatile machine.